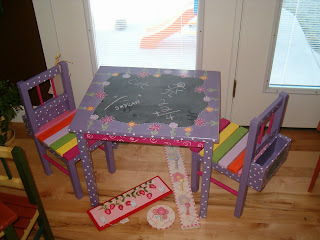 I painted up this unfinished kid's table and chairs from Michaels. I used chalkboard paint on the tabletop and made wooden boxes for the backs of the chairs to hold books. There is also chalkboard paint on the back of the wooden boxes so a child's name could be written on each chair. Excellent job! Its super cute!! I love this little table and chairs set! So cute! How adorable...you did such an AWESOME job! Happy Spring to you...have a great weekend! These are so cute! I would love them if I was a little kid. Heck, I love them as an adult! Stopping by from SITS. That table is adorable! Great job revamping it!